There are 123 Assisted Living Facilities in the Sun City area, with 8 in Sun City and 115 nearby. The average cost of assisted living in Sun City is $2,952 per month. This is lower than the national median of $3,346. Cheaper nearby regions include Peoria with an average starting cost of $2,862. To help you with your search, browse the 554 reviews below for assisted living facilities in Sun City. On average, consumers rate assisted living in Sun City 4.2 out of 5 stars. Better rated regions include Sun City West with an average rating of 4.6 out of 5 stars. Caring.com has helped 10 families in Sun City find high-quality senior care. To speak with one of our Family Advisors about assisted living options and costs in Sun City, call (855) 863-8283. Move in by 4/30/19 and receive 1 month rent free! Sun City, Arizona, has a wealth of entertainment and leisure activities for local seniors to explore including eight golf courses and frequent concerts. Situated close to the state capital, Phoenix, Sun City may provide seniors with an opportunity to make new friendships thanks to the extremely high percentage of seniors who reside there — over 75 percent of residents are aged 65 or over. Assisted living centers provide the necessary support for seniors who cannot live independently and require support with certain aspects of their day-to-day lives, like housekeeping, grooming, and medication management. There are almost ten assisted living facilities in the desirable Sun City area, and over 100 in nearby communities. Summers in Sun City, Arizona, are incredibly hot and provide the ideal climate for seniors who enjoy soaking up the sun during the summer months. Winters can be cold but are generally bearable. The Sun City area is home to world-class medical facilities, including the Banner Del E Webb Medical Center and Banner Boswell Medical Center, in the event of medical emergencies or illness. Sun City has an array of community resources for seniors, including the Banner Olive Branch Senior Center, an organization that offers seniors the chance to participate in free activities and meet new people in the area as well as more than ten other senior centers. Crime rates in Sun City are lower than the national average. On a scale of one to 100, where one represents the lowest crime rate, Sun City scores 25.0 for violent crime, and 29.5 for property crime. This is lower than the national averages of 31.1 for violent crime and 38.1 for property crime. This could be another factor that makes the area so appealing to seniors, hence the large demographic of residents aged 65 and over. The cost of living in the Sun City area is only marginally more expensive than the national average. The wealth of resources for seniors, coupled with the reasonable cost of living, may contribute to Sun City's popularity. Seniors who enjoy the arts can find lots to entertain them in Sun City. Highlights include the Sundial Auditorium and the Sun Bowl for watching shows, and the Art Club and Pottery Club for getting a little more hands-on. Assisted Living costs in Sun City start around $2,952 per month on average, while the nationwide average cost of assisted living is $4,000 per month, according to the latest figures from Genworth’s Cost of Care Survey. It’s important to note that assisted living rates in Sun City and the surrounding suburbs can vary widely based on factors such as location, the level of care needed, apartment size and the types of amenities offered at each community. 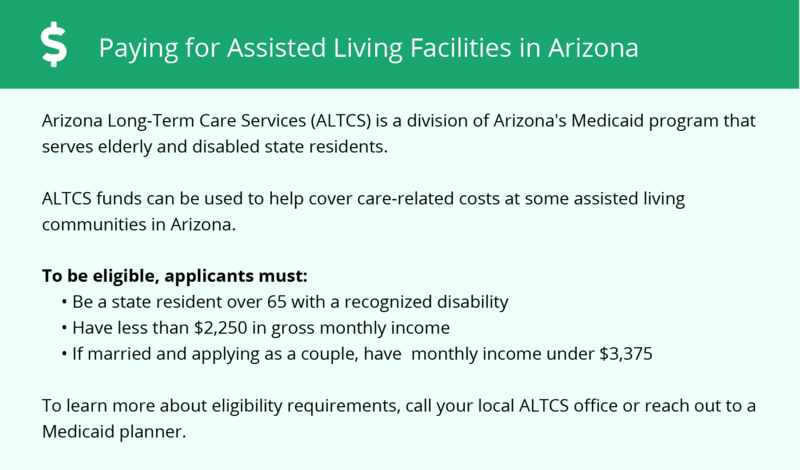 Arizona's Medicaid agency, called Arizona Health Care Cost Containment System (AHCCCS), can help subsidize the cost of an assisted living facility. 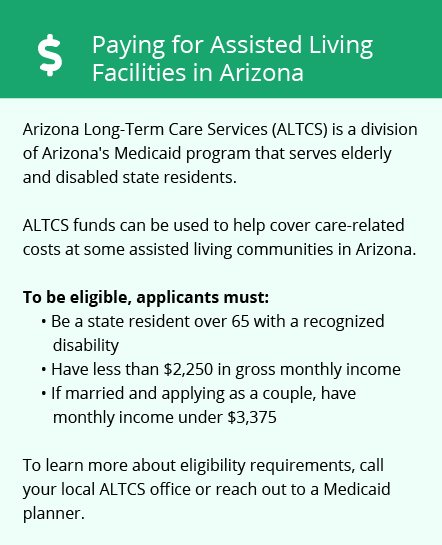 Learn more about these programs, plus who’s eligible, on our Assisted Living in Arizona page. For more information about different ways to finance assisted living, visit our Assisted Living in Arizona page. Sun City and the surrounding area are home to numerous government agencies and non-profit organizations offering help for seniors searching for or currently residing in an assisted living community. These organizations can also provide assistance in a number of other eldercare services such as geriatric care management, elder law advice, estate planning, finding home care and health and wellness programs. To see a list of free assisted living resources in Sun City, please visit our Assisted Living in Arizona page. Sun City-area assisted living communities must adhere to the comprehensive set of state laws and regulations that all assisted living communities in Arizona are required to follow. Visit our Assisted Living in Arizona page for more information about these laws.